This respected annual naval review is part of a dwindling number of similar books. A great pity the choice is reducing but great that this high quality publication continues. A must for anyone with an interest in naval affairs and the state of the world, strongly recommended. DESCRIPTION: This respected annual naval review is part of a dwindling number of similar books. A great pity the choice is reducing but great that this high quality publication continues. A must for anyone with an interest in naval affairs and the state of the world, strongly recommended. 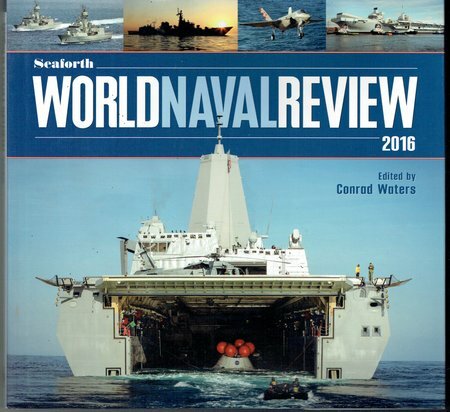 Once again, Seaforth have published a quality world navy review under an effective editor and respected contributors. During the last three years, the pace of rearmament has speeded up in the Pacific and tensions in the Mediterranean and Pacific continue to be a source of great concern. This tension is leading naturally to the increase of fleets and the introduction of new vessels and technology. Commentators are beginning to agree that there is a dangerous path to war that mimics the international situation before World War One. In Europe the preoccupation within the EU for an EU Armed Services under German leadership has both increased tensions in Europe and led to a reduction in spending, particularly by Great Britain. Since this book was completed, the British BREXIT vote has been a major factor in changing situations. An independent Britain, within NATO, and, redevelopment of its historic trading ties with the world outside the narrow confines of the EU, is already leading to the restoration of funding for the Armed Services and the preparations for the construction of the ‘Successor’ nuclear missile submarines, with US contracts recently placed for work on the design of a common missile tube system for both the USN Virginia Class replacements and the British ‘Successor’ program. In the Pacific, the Chinese attempts to expand is causing significant concern amongst its neighbours and fuelling a new arms race, complicated by the unstable North Korea. With the Russian attempts to fabricate a new Cold War, the global community is facing some very dangerous times. The editor and contributors have done a very good job of capturing and reviewing the state of navies and their equipment to the end of 2015 and it will be very interesting to read their next annual for 2017 to see how the trends have continued to develop.